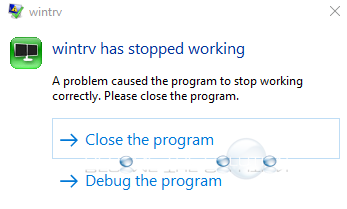 While trying to open Bloomberg Professional, you receive an error message about wintrv.exe stopped working. This prevents the Bloomberg application from opening. Update to the latest version of Bloomberg. There may be a conflict with other software or devices on your machine. If updating Bloomberg does not fix your issue, click on debug the program and send Bloomberg support this detailed information. The Bloomberg Professional Services software will automatically update while the application is running. Progress can be monitored by running the UPGR function on the Bloomberg Professional terminal. You can find a current list of Bloomberg updates on their website here if you wish to manually update.